All time the same problem. We will audit whenever a member of one of the SQL Server administrative roles logs on to my SQL Server Instance, the standard SQL audit “Successful logins only” provides this information, the SQL Server logs every connection, but without a focus of the members from the SQL server administrative roles. If I use the options “Enable Common Criteria compliance” or “Enable C2 audit tracking” both standards from the US Governance, we get many Information for all actions from the SQL Server ( on my SQL Server in 15 minutes 160 MB on log files only for C2 audit!) but no separate information to the administrative logins are provided. We have out of the box no options to see only the members with administrative rights to logon on to the SQL Server Instance. Here a overview of the standard options for auditing the SQL Server, Login auditing, Common Criteria compliance and C2 audit tracking. For the basic SQL auditing enable “Login Auditing” and “Common Criteria compliance”, with the option “Common Criteria compliance” we have also a very good statistic from the logon over a time period. 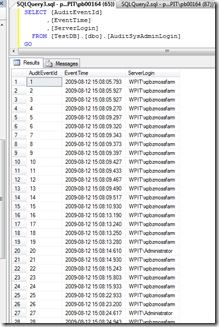 Can we track the administrative logins to my SQL Server instance? Yes we can! 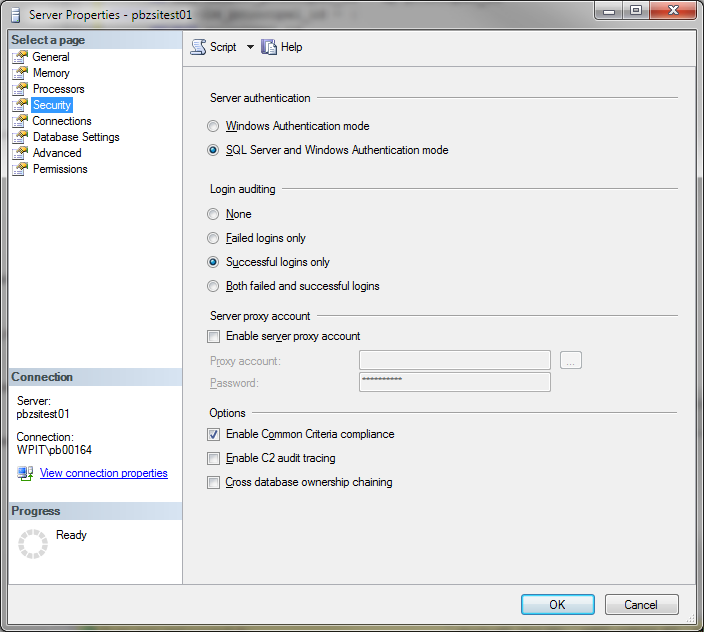 In SQL Server 2005 SP 2, Microsoft introduced logon triggers into the core functionality from the SQL Server. 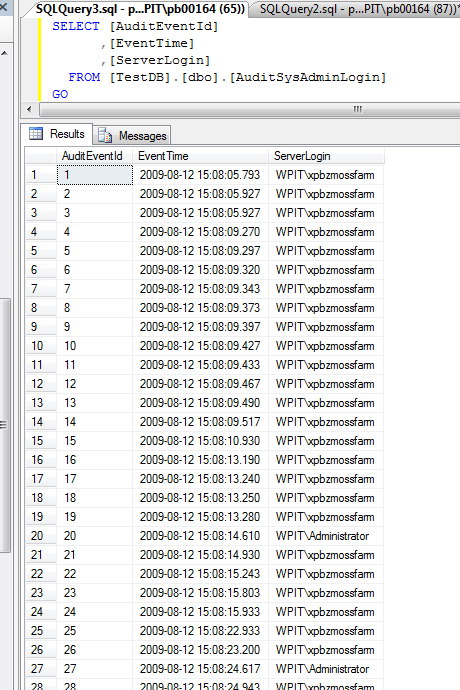 DDL and DML triggers, these triggers fire on particular events, in this case, whenever a logon to the SQL Server instance occurs. 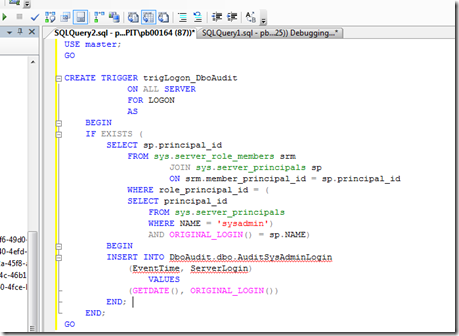 We can use a logon trigger to audit when members of one of the SQL Server administrative role, such as example the “syadmin” server role, logs on. That’s all. 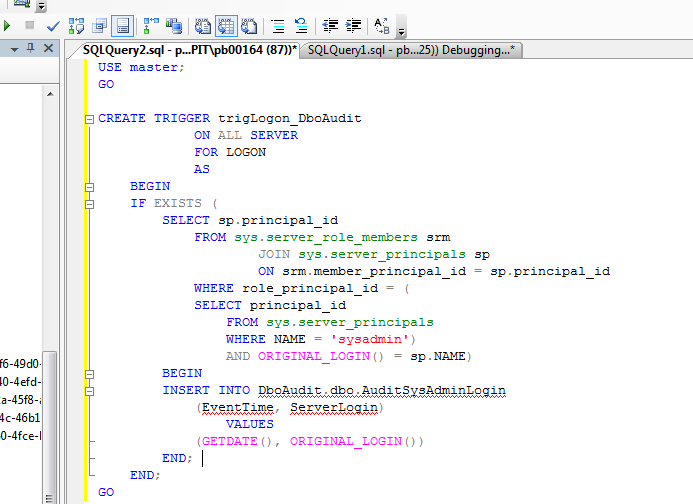 With this logon trigger all logon information’s for members of the SQL Server role “sysadmin” stored in our work database “DboAudit” on the SQL Server. If we need this information for logging or statistics we can provided this information over SQL very simple. But, What is, if we need only information of logon from users with “dbo” rights on a dedicated database? No problem, it’s the same way over logon triggers only with different functions and code. More in the next. 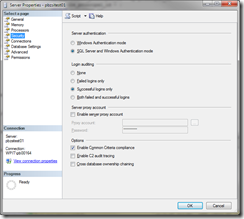 I have found the above Microsoft SQL Server Login Auditing with Logon document very useful. But I need to modify it so that I can use it for all logons and only for sysadmin. Excellent. What if I want to know which database the person is looged onto at the same time? What has to be changed to accommodate this requirement?